Pedal the streets of Lisbon and sample some of the city’s best snacks during this 3-hour bike tour. 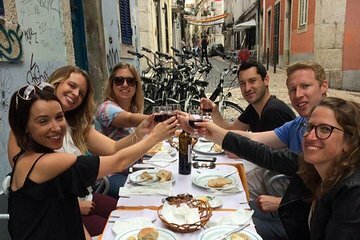 Pass through historic neighborhoods like Marquês de Pombal and Bairro Alto and stop at four local establishments for various food and wine tastings. Learn about the rich history of Portugal and the gastronomic influences that have made this city so famous. This bike tour is fantastic. Marta is an absolute pleasure to be with. The meeting place is easily accessible. The combination of sightseeing, history, and culinary tastes is hard to beat. The mid-day meal served in an authentic Portuguese restaurant is possibly the best we have eaten all week in Lisbon. The route Marta chose is easy to do for anyone. All in all, this tour will leave you feeling that you had a wonderful experience that was well worth the cost and that you would highly recommend it to anyone. Superb trip, excellent tour, great lunch and a very friendly and knowledge guide - Marta, there is no need to be a keen cyclist as the ride is not challenging. Our tour guide Marta was wonderful. This was a great way to see Lisbon. The bikes were great. The meeting place was centrally located. The food and drink was amazing. We learned a lot about Lisbon and had some delicious food. We saw things we wouldn't have found on our own. It was a nice bike ride. This was fabulous! Marta, our guide, was passionate about the history of Lisbon and also making sure we had the best experience. The bike route was gentle and combined with great food and wine, the tour was really enjoyable. Would thoroughly recommend this tour. This tour was wonderful! Our tour guide Marta was so friendly and very knowledgeable about the history of Lisbon. My husband and I got such a great introduction to the city, and saw so many of the beautiful sites during the tour. The bikes were comfortable and easy to ride. The food and wine were absolutely fantastic! It was such a fun experience, we would highly recommend it to anyone visiting Lisbon. The tour was Great! Marta was a fantastic guide, her local knowledge and friendly nature made the tour very enjoyable. The bikes were new, and routes we took were easy and safe to navigate. We had a great day and Would highly recommend to anyone visiting Lisbon! My husband and I love to tour a new city by bicycle, and this tour was really great! We got the lay of the land, a bit of exercise and fresh air, along with a great lunch. Marta, our guide, was knowledgeable about Lisbon, Portuguese history and food. We actually returned back to a few of the places she shared with us! A wonderful way to introduce yourself to the city! My boyfriend and I took this bike tour and it was fantastic! Marta, our guide, provided us a thorough tour of the city and the food and drink it has to offfer. Marta was great, very friendly and knowledgeable. She also gave great recommendations for the rest of our stay.